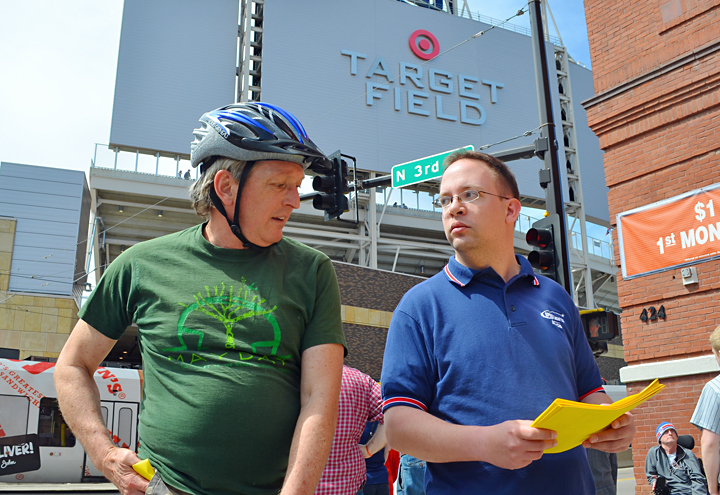 Fair trade activists handed out fliers outside Target Field Saturday. More than a year after sending proponents of fast track back to the drawing board, Congress is poised to consider a modified version of the trade measure this spring. Introduced last week as the “Bipartisan Congressional Trade Priorities and Accountability Act of 2015,” fast track is an essential step in the Obama administration’s push to enter the U.S. into new NAFTA-style free trade agreements like the 12-nation Trans-Pacific Partnership. In granting the president fast track authority, Congress relinquishes its constitutional authority to review and amend trade pacts, forcing members into an up-or-down vote on complex agreements like the TPP, which has 29 chapters and 1,000 pages of provisions. It’s a perilous method for setting trade policy, AFL-CIO President Richard Trumka said, especially given the secrecy surrounding TPP negotiations. Mindful that no trade deal – regardless of how devastating it was for U.S. jobs, family farmers or the environment – has ever been turned down by Congress under fast track rules, labor is intensifying its efforts to defeat the measure and stave off the TPP. In March the AFL-CIO announced it would freeze all contributions to federal lawmakers’ Political Action Committees and, instead, direct those resources to the battle over trade policy. Since then, union members and fair-trade activists across the country have dialed up the pressure on undecided members of Congress with rallies, phone banks and other outreach initiatives. Locally, the campaign has focused on Sen. Amy Klobuchar, a labor-endorsed DFLer who has not yet publicly opposed the new fast track bill, according to Berg. Other members of the DFL delegation, including Sen. Al Franken, are believed to be on board, she added. “We’ve been in Sen. Klobuchar’s office,” Berg said. “We’ve delivered oversized postcards with signatures from her constituents asking her to oppose fast track. We’ve sent letters to her Washington office. The Fair Trade Coalition, founded by labor, family-farm, faith and non-profit groups that opposed NAFTA nearly 25 years ago, took to the streets Saturday afternoon in Minneapolis. 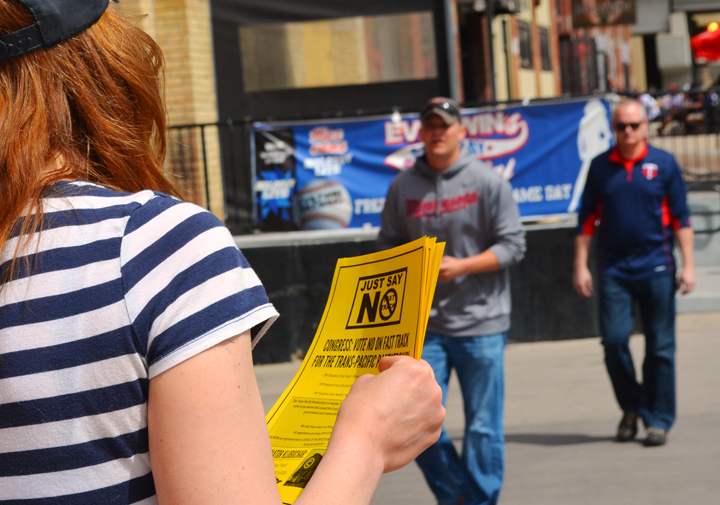 Volunteers handed out fliers to fans making their way into the Twins game, asking for calls to Klobuchar’s office.